The Pop-Up Art Loop program begins in three downtown storefronts. 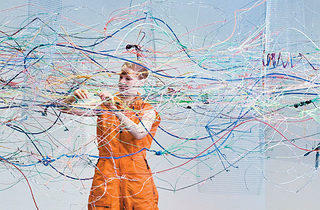 Photograph: John Sisson STRINGS ATTACHED Pop-Up Art Loop artist Sara Schnadt works on a site-specific installation at the Museum of Contemporary Art in 2007. Pop-up galleries have burst on Chicago at last. We first read about this phenomenon months ago: As the recession squelches demand for commercial properties, landlords from London to New York to Evanston have decided to turn their empty spaces over to art—temporarily—rather than let them languish as vacant eyesores. On November 24, the Chicago Loop Alliance (CLA) initiated the Pop-Up Art Loop program in three temporary galleries. At 29 East Madison Street, suite 170, visitors can enter the Chicago Photography Collective’s free exhibit featuring works by 25 professional photographers, including Patty Carroll and Paul Natkin. 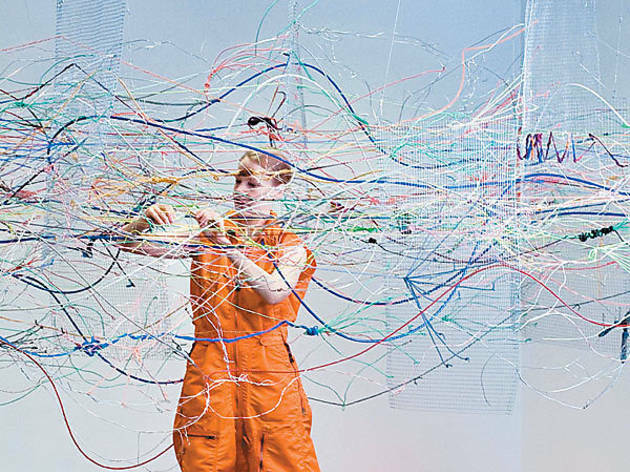 The public can also step inside Sara Schnadt’s string-and-mirrors installation Network at 220 South Wabash Avenue. In 2007, Schnadt, an artist who serves as a performance-art curator and Web master for the Department of Cultural Affairs (DCA), created a similar piece for the Museum of Contemporary Art’s UBS 12x12 series (pictured). In other cities, pop-up galleries have been initiated by artists, curators and local governments as well as business-oriented organizations akin to the CLA. Burros, also reached by phone, says the DCA won’t oversee a pop-up gallery program itself, but it’s consulting with several “neighborhood organizations and aldermanic offices,” such as Vi Daley’s in Lincoln Park, that want to foster their own temporary art spaces. “The really tricky part is dealing with the landlords,” she says, suggesting locally based groups would find it easier than the DCA to persuade neighborhood property owners to donate space. The DCA has ample related experience to draw on as consultants, however: Burros cites the Open Studio Program, which enabled passersby to watch artists at work in the vacant Page Brothers Building (177 N State St), and temporary installations in the Chicago Pedway. “We’re pursuing meetings with the Department of Business Affairs,” she adds, to propose licenses permitting pop-up galleries to sell the artwork on display. The Pop-Up Art Loop galleries are open Tuesday–Sunday, 11am–7pm, through December 31. For more information, visit popupartloop.com.